﻿ The Vortex offers one of the most "real" dining, drinking, and comedy experiences in all of the city of Atlanta. I particularly find their "Idiot-Free Zone" policy amusing (the language in which it's written, actually) and would never want to be on the wrong side of an incursion of said policy. 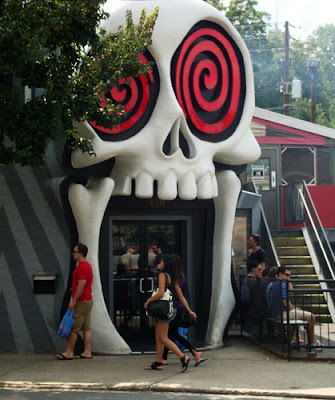 The Vortex is an Atlanta favorite (I myself enjoy going there). Locals go there in droves and bring visitors there in droves. It's a unique experience, especially after a tranquil visit to the Atlanta Botanical Garden, the World of Coca-Cola, or the Margaret Mitchell House...a visit that many will remember for a very long time to come. More on the Idiot-Free Zone: "We reserve the right to refuse service to anyone, especially if we think you're being a big jerk. We strive to keep The Vortex an official Idiot-Free Zone at all times, so if you're acting like an idiot we'll be sure to let you know, right before we throw you out." Sound harsh? Not at all. Actually, I wish more establishments had such an outspoken policy. There's a time and place for everything (Your mother told you that too, right?). Certain behavior is just not appropriate in certain venues, events, or gatherings...so, kudos to The Vortex for telling it how it is and for being an Idiot-Free Zone! Really, are you going to blare the latest Reba song while attending an Atlanta Symphony Orchestra performance? No, they'd throw you out. Are you going to chain-smoke at Georgia Aquarium? No, they'd throw you out. Are you going to swear at a tour guide at the Fox Theatre? No, they'd throw you out. So when dining at The Vortex, behave! Otherwise, as noted, they will throw you out! The Vortex has locations in Little Five Points (photo) and on Peachtree Street in Midtown...and be sure to catch their comedy musings at the Laughing Skull Lounge adjacent to their Midtown location. Atlanta really does has something for everyone...The Vortex is an excellent testament to that fact.